So often here on ReboReports we talk about new and exciting ways to get leads. But that’s only part of the process for running a successful real estate business. 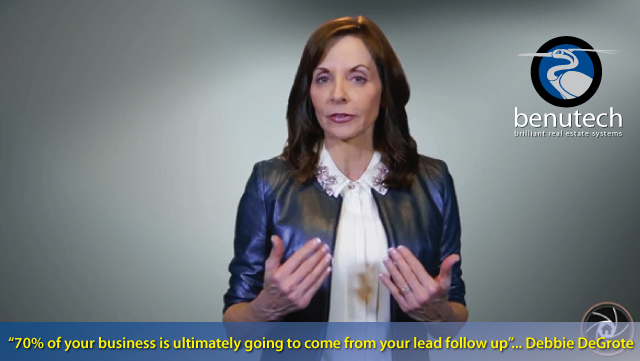 As real estate coach Debbie DeGrote discusses in this quick tip, follow-up can be more important than getting the lead in the first place. Hi my name is Debbie DeGrote and I am the owner and President of Excelleum Coaching & Consulting and I am here today to do a segment “Debbie’s Tips” for ReboReports. So what we thought we would talk about today is lead follow up. Obviously, you are prospecting, or at least we hope you are, and as you find those great prospects I find that one of the biggest gaps in a real estate agent’s business is their lead follow up. And it is kind of crazy when you think about it, why would you prospect diligently and then not follow up on the leads. Well, it could be a number of reasons. It could be simply that you do not have a good system. It could be that you have too many leads and you are overwhelmed. And it could be that you are keeping bad leads and when you call them you are discouraged. So what I would encourage you to do, as an assignment from today’s tips, is to clean house on your leads. Decide who really are your hottest and best. And also make sure you get some simple type of system going so you can methodically follow up and remember to call them back. Because you know statistically about 70% of your business is ultimately going to come from your follow up versus that very first call. Now if you need some scripts to help you, you can go to my website, Excelleum.com, and you can download a little mini pack called “The Scripts Light”. So we give you just a few scripts to help you in this process. Good luck and we will talk to you on the next “Debbie’s Tips” and ReboReports.